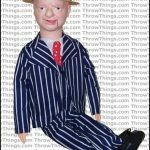 The W.C. Fields basic ventriloquist doll is 30 inches tall, dressed in a smart suit and wearing his distinct straw boater hat. A vinyl carrying case is also included to pack him into when he’s not busy making everyone laugh. 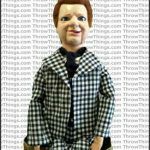 By pulling a string in the back of his neck, the ventriloquist can make the doll’s mouth move. Also included is an informative “Seven Simple Steps to Ventriloquism” booklet to help you master this fun and interesting skill! W.C. Fields was one of America’s greatest-ever comedians, with impeccable comic timing, sarcastic quotes and a cantankerous – yet charming – persona. 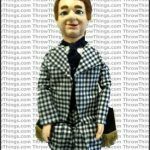 Little wonder then that W.C. Fields doll is one of the best selling ventriloquist puppets, so much so that there are FOUR different upgrades of dummy available! 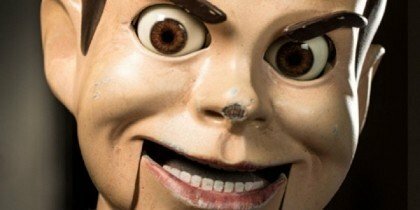 If you’re looking for an upgraded version of the basic W.C. ventriloquist dummy, he is also available as a Standard Upgrade doll. Featuring a hard, hollow body features a ball and socket neck. 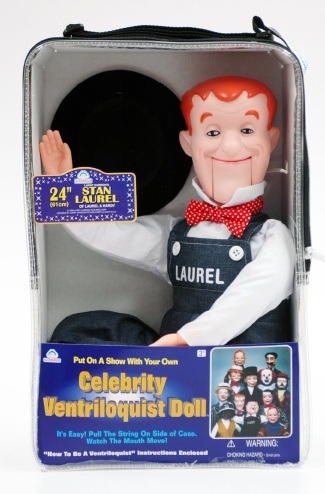 By using the control stick, the ventriloquist can easily turn the doll’s head fully around, and even tilt and nod it too. Easy one handed operation is facilitated by the control stick, which also opens and closes the doll’s mouth by pulling a lever. 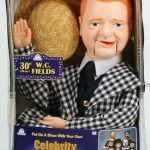 If you’re serious about your act, it’s perhaps worth investing in the W.C. Fields Deluxe dummy, which adds moving eyes – also operated by a control stick – and a lifelike wig. This puppet is for the true connoisseur ventriloquist, as it features all of the upgrades but also adds moving eyebrows. As with the other upgrades, it’s still easily operated by one hand using the control stick to move all the functions – eyes, head, eyebrows.